Esplendor Hotel is a very popular hotel with an unusual design that can hardly be found anywhere else. Its designers, the Argentinian art group called Mondongo, created a whole picture gallery with portraits of famous people, such as football player Diego Maradona, revolutionary Che Guevara, and many others. The uniqueness of these portraits is in the way they are made – the designers used different materials at hand, such as modeling clay, shotshells, wine corks, glass beads, golden chains and even food to make the pictures. These portraits can be found everywhere – in the hotel’s hall, passages, and at the restaurant. Travelers always praise these creative works and enjoy examining them in detail. There are unusual thematic hotels in Buenos Aires, and Complejo Tango Boutique Hotel is one of the best in this area. This is a charming boutique hotel in the heart of the city not far from the signature landmarks of Buenos Aires. Complejo Tango Boutique Hotel is dedicated to one of the main symbols of the city – tango. The hotel is decorated with many interesting thematic items, including old vinyl records, black and white photos picturing musicians and dancers, vintage posters and other interesting antiquities. Guests of the hotel are invited to participate in various interesting events and special dancing classes. 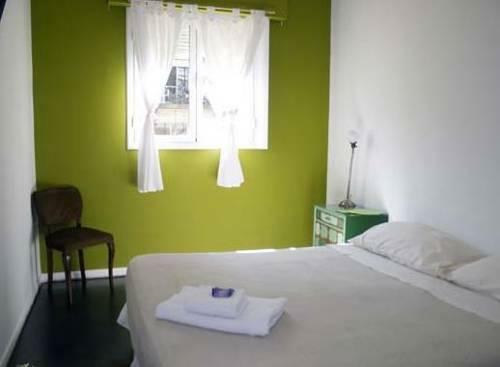 Savvy travelers will be fond of Eco Pampa Palermo Hostel . This eco-friendly hostel is by far one of the most unusual places in the city. Located in Palermo Soho neighborhood, the hostel occupies a beautiful historic building with some carefully preserved original décor. Eco Pampa Palermo Hostel is distinguished by bold design that amazingly combines colorful textiles, modern designers’ and authentic vintage items. Travelers, who prefer to stay at small private hotels, will surely like Linas Tango Guesthouse. This charming guesthouse is located in a beautiful historic building. Inside, owners of the guesthouse did their best in maintaining the high-class atmosphere of the past. Linas Tango Guesthouse has only five charming rooms, and its public zones look more like museum halls. A beautiful library with a large collection of books, a charming patio and an inner yard with greenery are among advantages of this wonderful guesthouse. Traditionally, guests of this miniature hotel are invited to attend tango master classes, a popular nationwide entertainment. Miravida Soho Hotel & Wine Bar is a mini hotel that doesn’t look much different from the majority of other hotels at a glance. The hotel is open in a fully restored mansion and has six charming rooms. The hotel is designed in accordance with traditions of the past, but it’s the unique wine cellar, not retro décor, that attracts visitors to the hotel. The cellar is located in the basement, in the hall with original brick walls. Here wine connoisseurs will be treated with the best wine brought from different parts of Argentina. This guide to unusual hotels of Buenos Aires is protected by the copyright law. You can re-publish this content with mandatory attribution: direct and active hyperlink to www.orangesmile.com.